''There,' says Alice Hayward to Reverend Stephen Drew, just after her baptism, and just before going home to the husband who will kill her that evening and then shoot himself. Drew, tortured by the cryptic finality of that short utterance, feels his faith in God slipping away and is saved from despair only by a meeting with Heather Laurent, the author of wildly successful, inspirational books about angels. Heather survived a childhood that culminated in her own parents' murder-suicide, so she identifies deeply with Alice's daughter, Katie, offering herself as a mentor to the girl and a shoulder for Stephen - who flees the pulpit to be with Heather and see if there is anything to be salvaged from the spiritual wreckage around him. But then the State's Attorney begins to suspect that Alice's husband may not have killed himself and finds out that Alice had secrets only her minister knew. Secrets of Eden is both a haunting literary thriller and a deeply evocative testament to the inner complexities that mark all of our lives. Once again Chris Bohjalian has given us a riveting page-turner in which nothing is precisely what it seems. 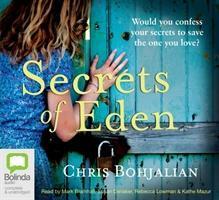 Chris Bohjalian is the critically acclaimed author of eleven novels. His work has been translated into nineteen languages and published in twenty-two countries. He lives in Vermont with his wife and daughter. Mark Bramhall's extensive theatre work in Los Angeles and New York includes performances in Our Town, Julius Caesar, Tartuffe, The Learned Ladies and The Winter's Tale. He has had recurring television roles on Alias, That '70s Show and Days of Our Lives. His other television and film credits include 24, ER, Vanilla Sky and Introducing Dorothy Dandridge. Susan Denaker's extensive theatre credits include numerous plays in the West End of London, national tours, many English Rep companies, including a season with Alan Ayckbourn's company in Scarborough. More recently in the U.S., Susan has appeared in Our Town and Sweet Bird of Youth both at the La Jolla Playhouse and Breaking Legs at the Westport Playhouse. Rebecca Lowman is a performer of stage, film and television. In addition to playing the lead in Eve of Understanding, for which she won Best Actress at the 2006 Boston Film Festival, she has appeared in the television series Burn Notice, Private Practice, Criminal Minds, The Shield, Big Love, Without a Trace, Cold Case and Will & Grace. Kathe has recorded over 100 audiobook titles for Random House Audio, Audible.com, Harper, Blackstone, Tantor, Skyboat, and others. Her recording of 'Quiet: The Powerof Introverts in a World That Can't Stop Talking' was named a Best Audiobook of 2012 by Audiofile Magazine, and was also named Best Non-Fiction Audiobook of 2012 by Audible.com.